Take IH 35 to Exit 261 Turn Left at S.H. 29, crossing over the IH 35 Bridge. Travel East to Main St. (0.74 miles), take a left at traffic light. Public 4-story parking garage located at 4th and Rock Streets. Please be courteous to our downtown residents and do not block drive ways. Visitor Center 103 W. 7th St.
Municipal Court on the corner of 7th & Main St. Kids are welcome to enjoy some Kettle Korn during the movie. support and generosity of our valued sponsors. 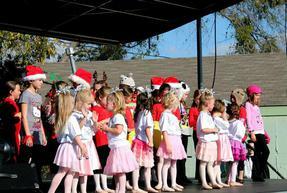 the Christmas Stroll Parade on Saturday at 10am. The young and young at heart will all enjoy this event as the Christmas Stroll has something for everyone. re-enactment of life 2000 years ago in Bethlehem Village, including a live manger. There's lots of fun for kiddos, too! First stop is usually a visit with Santa, of course! Parents love watching them burn off the energy on the Mount Everest Climb-n-Slide, playing street hockey and braving the rock wall. Kids can try their hand at building at the Home Depot make & take booth! Allow plenty of time to enjoy live musical performances by local performers, area schools and organizations. selection will satiate the choosiest of eaters!